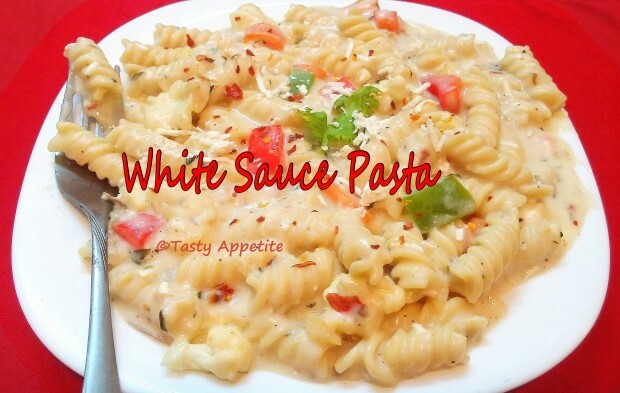 Hy Friends, Today's recipe is rich & delicious creamy white sauce pasta preparation that is very easy to make. My kids are big fan of pasta & I love to prepare this delicious pasta frequently. You'll love this easy flavorful recipe that makes perfect for summer cookouts. Here's how you can try your hand at favorite pasta recipe, guilt-free..!!! Add pasta along with hot water. Add 1/2 tsp of salt and 1 tsp of olive oil. Stir and allow to cook. It will take approx. 7 mins for the pasta to cook soft. Also you can pressure cook pasta for 4 whistles in cooker. Take care the pasta shouldn't turn mushy. Drain the water from the pasta and set aside. Add grated garlic and toss. Add all chopped vegetables and give a good stir. Sprinkle salt and pepper pwd. Remove the vegetables and set aside in plate. Now melt butter in the same pan. Add maida / all purpose flour. Stir and cook maida for 2 mins in low flame. Add warm milk and mix. Allow the mixture to cook till it reaches creamy consistency. Add little water and adjust the consistency. Add salt, pepper pwd, red chilly flakes and oregano. Add all the vegetables. Mix well. Now add the cooked pasta. Sprinkle some crushed basil and fresh herbs for added flavor. Also you can add some grated cheese for garnishing. That's it Creamy delicious White sauce pasta is ready. i have never eaten pasta in my life !! !